Live in Minden Even Though Your Employment is Outside of the City. You can still experience the small town living in Minden and commute comfortably to work in another city within 30 miles. 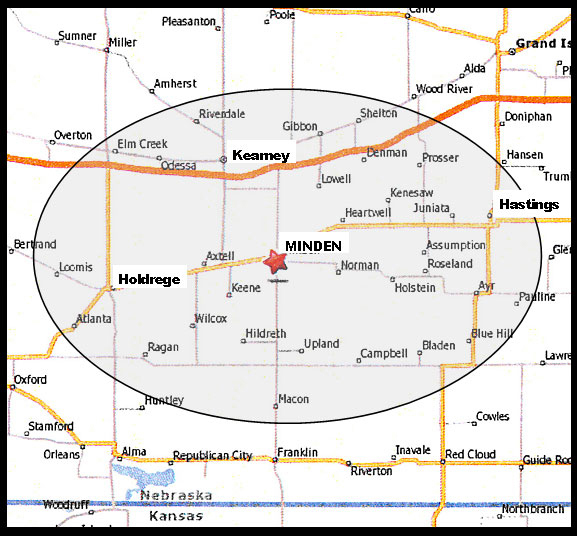 Minden is centrally located with commute times ranging from only 20 to 30 minutes to Kearney, Hastings and Holdrege, NE. With commute times in rural Nebraska being almost equal to the number of miles traveled, commuting to an area city on the highway is quick and easy. You benefit because you experience a lower cost of living that comes with living in a smaller community. Search through Minden's Employment Opportunities or look at MindenJobs on Facebook to find a job in Minden. Sign up to receive a text message or email when a job opening is posted for the City of Minden or by a local business on the City's website. Check the Monthly Unemployment Rate in Kearney County.